In this post I’m going to simply drill down into the superfunction human resources via the spreadsheet analysis below which compares actuals for 2007 and 2010 with the President’s budget estimate for 2016. It’s instructive to compare the individual function percentage increases between 2016 and 2010 in health, medicare and social security to total federal outlays, i.e, health 61%, medicare 41.4%, social security 35% to the total of 27%. Fully 75% of the increase in total outlays for the period, $945 billion, is due to those three functions. These 2016/2010 increases sit on top of the massive increases between 2010 and 2007. The President’s 2016 estimate shows the GDP growing at an annualized rate of 5.31% from 2010. Through the 3rd quarter of 2011 the GDP grew at annualized rate just under 2%. A consensus of economist’s believe growth will stay in the 2% range through 2016. In that case the 2016 budget’s a fantasy. Something’s got to give. 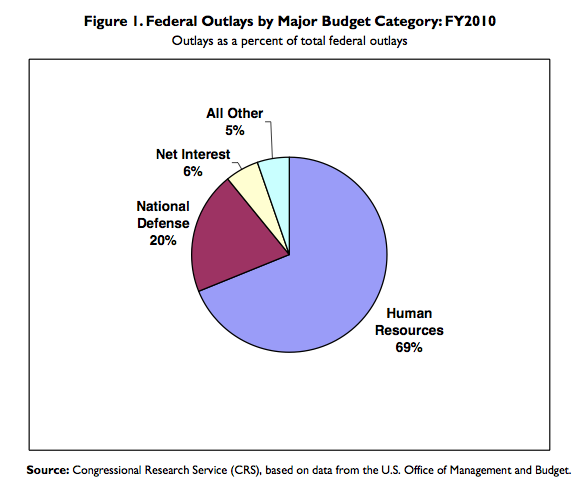 This is the third in a series exploring the U.S. budget. Click here for the 1st and here for the 2nd. Gallery | This entry was posted in Fin Lit and Civics, Financial Literacy Basics and tagged Financial Literacy, Financial Planning, Money Management, Personal Finance, Personal Financial Planning, Retirement Planning. Bookmark the permalink. Amazing as always Mr. Jay. Very clear, exact and easy to understand. Have you not forwarded this to the White House yet?